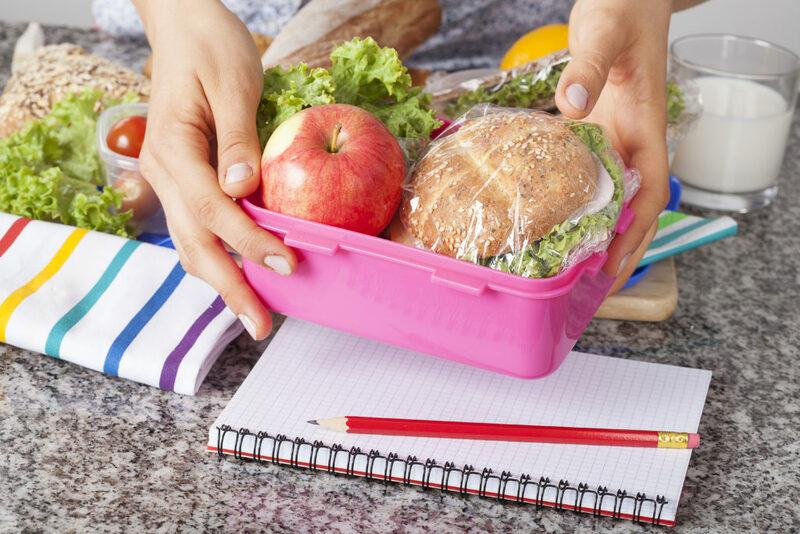 Why not brighten up these Autumn days with a lunch box treat? We can all find it difficult to come up with new sandwich fillers and this can be more of a challenge when you trying to stick to your kidney friendly diet. Here are a couple of suggestions which will use up Sunday lunch leftovers and hopefully brighten up Mondays lunch box for the whole family. Each recipe will tell you how many protein exchanges, as well as how many portions of fruit, vegetable, it provides per serving. All coding is based on one serving and not the full recipe. Check your diet sheet to see what your allowances are. All the recipes are kidney friendly and do not include ingredients that are high in potassium, phosphate or salt. If they are low in fat they have been marked low fat. The coding system, which is based on the Irish Nutrition & Dietetic Institute (INDI) renal diet sheet, was developed for the Truly Tasty Cook book by Valerie Twomey. In a small bowl, mix the sour cream, radishes, vinegar, pepper and Tabasco sauce. 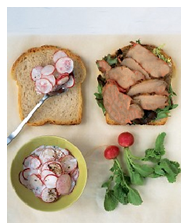 On 4 slices of bread, layer a small handful of mixed salad greens, 2 oz of roast beef and the radish salad. Top each with another slice of bread and serve. Per portion this dish provides: 319 kcal, 1 portion of vegetables and 2 protein exchanges. Slice the courgette into ribbons with a vegetable peeler. Combine with the red onion, lemon zest, lemon juice, olive oil and a pinch of pepper. Let stand for 30 minutes. Meanwhile roast the chicken breast or use leftover roast chicken. Let cool, then shred and add to the marinated courgette along with a handful of fresh parsley. 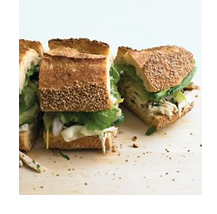 Split the bread rolls, put a leaf of lettuce in each and then divide the chicken mixture, including the juice, between the 5 sandwiches. Enjoy! Per portion this dish provides: 315 kcal, 1 portion of vegetables and 3 protein exchanges. Melt the butter, sugar and golden syrup in a saucepan over a medium heat. When melted, remove from the heat, add the oats and grated apple and mix well. Grease a 20cm square cake tin and line with baking parchment (this makes it easier to get the flapjack out when it’s cooked). 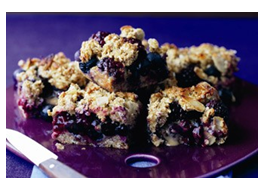 Press half the flapjack mix into the base of the tin, tumble the blackberries over the top and top with the rest of the flapjack so the blackberries are sandwiched in the middle. Press down slightly to stick all the layers together. Bake in the centre of the oven for 25-30 minutes until nicely browned. This flapjack may take longer to cook than normal flapjack due to the moistness of the added fruit, it will also remain moist when cool. Per portion this dish provides: 204 kcal, ½ portion of fruit.